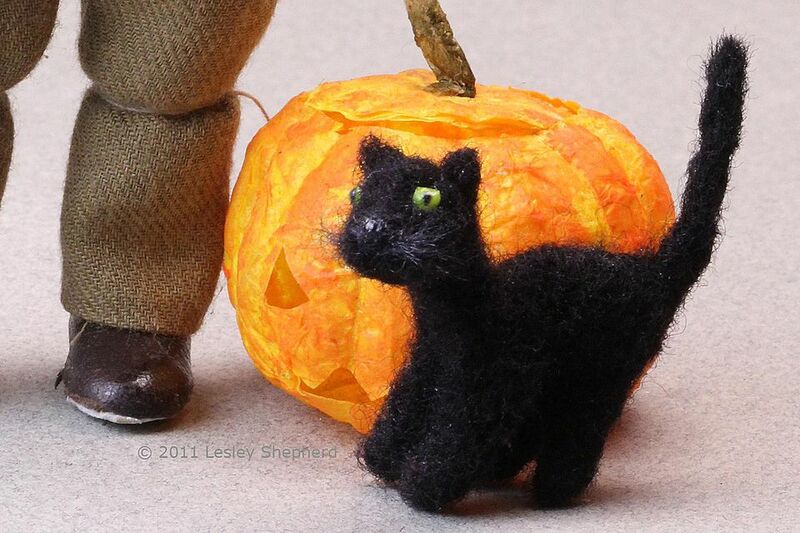 Needle felt cats for miniature scenes using wool or silk roving over a frame of pipe cleaners. Like needlefelt miniature sheep and needle felted miniature dogs, the cats can be made using simple to learn easy needle felting techniques. As breeds of cats can have quite different shapes, it is important to have a photo of your desired cat in front of you as you work. This tutorial features a short-haired black cat for Halloween, but, you can add longer coats to your cats, and vary the colors of their coats. Needle felting is an easy, repetitive technique, and making a cat from beginning to end takes only a few hours. After you attempt your first cat, try another, slightly different pose or breed to develop your technique. To make miniature cats, the animal's coats and head are made by needle felting roving (unspun fiber, usually wool, mohair, or silk). A felting needle is pushed straight up and down with a punching motion through a ball or mat of fiber, set on a foam pad or mat. The action of the felting needle pulls the fibers together. Wherever you insert the needle it will compact the fiber, sculpting it into shape. If you felt an area a lot, it will make hard, compacted items. If you felt it less, it will create softer, less dense sculptures. The technique is easy (and repetitive). If you make a mistake and pack your fibers too tightly you can remove some then refelt, or add more to build out your shape. Roving or Unspun Fiber - In your choice of colors. For a 1:12 scale cat like the one shown, you will need less than an ounce of wool roving. Most yarn stores sell roving for felting in a wider range of colors. Costume suppliers and doll making suppliers usually have mohair roving for dolls hair or actors beards and mustaches. If necessary you can use a card or tease wool fibers from old sweaters or yarn and use it for felting. Pipe Cleaners - A 1:12 scale cat uses a single pipe cleaner as a body frame, fibers on pipe cleaners make it easier to catch the wool roving. If you don't have pipe cleaners, use wire, something around 24 gauge should be fine. Needle Felting Mat - or piece of thick foam to protect the surface you are working on and help keep your needles from breaking. Felting Needles - Medium, fine, and extra fine felting needles give you a good range for fine shaping. These are very sharp long needles with notches up the shaft, which pull and mat fibers together. They are available from yarn suppliers who sell felting materials and are also available online. I use sizes 38, 40 and 42 for miniature animals. If you intend to work only with wool, sizes 36, 38 and 40 are also suitable. Photo of a Cat - A photo or live model in front of you makes it easier to get the correct shape for your needle felted animal. Glass or Polymer Clay Eyes or Beads - You can use polymer clay from the technique used to make miniature eyeballs. For toys which may be handled by children, use simple felt eyes made from scraps needle felted into place. Sharp Scissors - To trim the cat's coat to shape. Wire Cutters and Tweezers - To cut and bend eye wires and pipe cleaners into shape. Ruler - To measure body frame parts. Start making your miniature needle felted cat by cutting the body parts. Cut three pipe cleaner sections which were slight variations of 1 3/4 inches long. The longest section is used for the cat's body, wrapped around the next longest section for the back legs leaving a roughly 1/4 inch stub to hold the tail, and wrapped around the final section which forms the cat's front legs, leaving a slight stub for the neck as shown. Felting needles break easily so always work straight up and down and do not force the needle. The needles must be pushed in far enough for the jagged edges of the needle to catch the fibers, you need to poke more than the tip of the needle through the roving. Start felting your miniature cat, by taking the body frame and laying it flat on your felting mat or pad. Take a group of fibers from your wool or silk roving to form your cat's coat. Roll the fibers slightly to make them into a loose yarn. Run a bit of your loose yarn down the bottom 1/4 inch of the cat's leg and over the bottom end of the pipe cleaner. Bring the yarn back up the leg, wrapping it around the leg and the bit of yarn you ran down the leg and over the leg and around the leg, over the yarn you laid around the bottom of the leg. Continue to wrap over the other legs in the same way, then wrap around the body. Begin to work your felting needle through the yarn wrapping the body, gently working it through the edges of the yarn wrapped around the legs and body, turning the body over and working from the other side, then working from the edges in against the legs. To make a needle felted tail for a miniature cat, roll a loose strand of threads roughly the length of your cat's body, or slightly longer. Make sure the roll is larger (thicker) than the tail you want for your cat, it should be roughly 1/3 thicker than the size you want your tail. Use your felting needle and work it up and down along the length of the tail, turning or rolling the tail as you felt. Leave the thickest end of the tail unfelted as the point where you will attach the tail to the needle felted​ cat. When your tail is roughly the correct shape and length, spread out the fibers at the base of the tail and use your needle to felt the fibers to the stub of pipe cleaner that you left for the base of your cat's tail. Work the fibers all around the pipe cleaner to cover it. If necessary, wrap extra roving around the base of the tail and needlefelt it in place with the pipe cleaner fully covered. You should be able to pose your cat's tail up, down, or curved to the side of the body for a sitting or laying cat. Don't worry about finishing the tail, you will trim it to its final shape when you trim the rest of the body. With the tail in place, continue to work your needles through the body of the miniature cat, using finer needles to shape the legs and the main body to the shape you want. As you work on the body shape, try to keep the paws slightly thicker than the legs, by working more through the legs above the paws, than through the paws. Work your needle all around the legs, flipping the body over every once in a while to felt the other side. Start the head of your miniature cat by rolling a group of roving fibers into a loose ball between the palms of your hands. The ball will be about 1 inch in diameter for a 1:12 scale cat depending on the breed of cat you are making. Lay your ball on your felting foam or mat, and start pushing your coarsest needle through the ball to felt it. I used a # 38 needle to start to form the cat's head. Poke the needle through the ball in a straight up and down motion (watch out for your fingers the needles are sharp and jagged!) These needles break easily so always work straight up and down. The needles must be pushed in far enough to catch the fibers in the cut edges of the needle, you need to poke more than the tip of the needle through the roving fibers. As you felt, keep one side of your ball unfelted, that will be the neck where you will attach the head to the body. When you have the head ball roughly the size you need, begin to shape it to a slight point on one side away from the neck where the cat's nose will be. To make ears, felt a rough 1/4 inch to 1/2 inch flat section of fleece. When it is thoroughly felted on both sides (and still thin and flat), use your scissors to cut two small pointed ears. Try to match them closely for size. If you wish, depending on the breed of cat you are making, you can use a different color to outline the ears or add a different color to one side to color the inner ear. When you have the ears the right size and shape, attach them to your miniature cat's head. To attach your ears to the head, place the ear on the top of the head at the back of the head, and carefully use your needle to punch through the base of the ear and into the head fleece. Be careful not to poke your fingers! Felt the ear securely in place at the ear's base. If it is not facing the correct direction, turn it with your fingers and continue to work the needle through the ear until you are happy with its position. With the ears in place, begin to shape the cat's face, by working the finest felting needle through the area where the eyes will sit, roughly 1/3 of the way down from the top of the head. Work the needle carefully around the face at the eye level, to push the face in making a shelf for the nose below the eyes. The way you shape the cat's head will be determined partially by the breed of cat you are trying to make. Persians, for example, have much flatter faces than many other breeds. Try to keep a slightly rounded nose just below the eyes. You may want to needlefelt a line for the mouth below the nose. If you need to mark or felt the mouth open, you can add a tiny pink tongue or a line of pink to mark the line of the mouth. When you have your cat's head, roughly finished in shape, check that the size is correct by laying the head in position at the end of the body. If the head is too big - keep felting it to make it smaller. The more you felt any area the smaller and denser that area will become. If the head is too small - take small balls of fiber and add them to areas of the head to build it out to the correct size and shape. Finish the head of your miniature cat by adding eyes, nose, and whiskers. Add Eyes - The eyes can be small glass eyes on wires, purchased from teddy bear suppliers. If you are going to use polymer clay eyes made with slanted pupils, and very little white, you can glue them in place in recesses you felt into the head. Add a Nose - You can form a nose from a small ball of colored thread and felt it onto the face. Add Whiskers - To add whiskers, gather up some fine thread into a line and felt it to the cat's face just below and on either side of the nose. When the head of your needle felted cat is the shape you want, lay the unfelted fibers at the neck area along the stump of the pipe cleaner you left for the base of the neck on the body. Carefully felt the head in place on the body, making sure you felt all around the neck area. If necessary, wrap a loosely twisted roll of fibers around the neck of the cat and felt them in place over the join between the head and the needle felted body. Make sure your head is not twisted or felted into an awkward position. Use fine sharp scissors to trim away any spare hairs from the body of your needle felted cat. Take care not to cut too deeply into the felting, you are only attempting to trim away the loose hairs to make sure the cat has a neat, well-defined shape. After you have trimmed your cat to shape, add extra felt into any areas where your cat's coat is too thin (where the pipe cleaners show through) or where your cat needs a bit of extra shaping. If you want to make a long-haired cat, trim the cat's head and body to make sure they are the correct shape and finish, then lay sections of hair over the body, beginning at the lower legs, and felt the sections in place at the top of the fibers, leaving long sections hanging free. If you can't get your cat to sit in the pose you want don't despair. Every creation is different and as artisans will tell you, each project develops its own personality. Your cat may decide it doesn't like laying down. You may have to work out why it adapts the pose that seems to suit it and make adjustments to your next miniature to get it to pose the way you want. Remember that the first animal of any breed you make with the needle felt technique is really a prototype to help you refine your techniques.